What Benefits Do Rain Gardens Provide To My Community? What Types Of Plants Thrive Best In A Rain Garden? 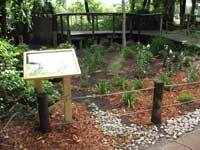 As a rule, native vegetation should be incorporated into a rain garden. Native plants don’t require fertilizer, have good root systems, and are better at utilizing the water and nutrients available in their native soils than non-native species. 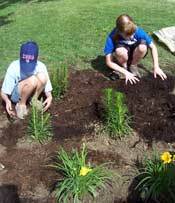 Perennials, shrubs, wildflowers, or a mixture of all three can be planted. Check with your	local nursery for a list of rain garden approved plants for your hardiness zone, or search the rain garden plant database. As a rule of thumb avoid planting trees in your rain garden, as trees generally absorb more water than surrounding plants. Also, never plant invasive or noxious species in a rain garden, such as purple loosestrife. What Is The Average Size And Placement Of A Rain Garden? A rain garden should have an area about 20% the size of the roof, patio, or pavement area draining into it. A typical rain garden for a residential home or small building is between 100 and 400 square feet. Regardless of the size, big or small, each rain garden can make an impact. Rain gardens are shaped longer than they are wide and positioned perpendicular to the slope of the land in order to catch the maximum amount of rainfall. Rain gardens should be placed at least 10 feet away from building foundations and should not be located where water ponds for an extended period of time. What Makes A Suitable Site For A Rain Garden? The site does not interfere with any trees. If there are trees in the area, make sure they can handle wet soil conditions for lengthy periods of time. If the site that you have chosen does not meet all of the above criteria, it does not necessarily mean that a rain garden cannot be established there. Speak with a professional landscaper to review your options. What Is The Typical Cost To Design And Install A Rain Garden? The cost of a rain garden is dependant on the property’s soil type, the size of roof/driveway/patio draining into a rain garden, and the types of plants chosen. If the soil is high in clay content, it may be a good idea to install an under drain system to prevent standing water in the rain garden for more than 48 hours. For a self-installed rain garden, expect to pay between $3 and $5 per square foot in plant costs and soil amendments (peat moss, for example, should be mixed in to soil with high levels of clay). When working with a landscaping company to design and install your rain garden, the cost will significantly increase to around $10 to $15 per square foot. What Kind Of Maintenance Does A Rain Garden Require? When native plants are used, your rain garden will not require pesticides or fertilizer. As the rain garden is establishing during the first and second year or during periods of little to no rainfall, occasional watering of the plants may be necessary. Likewise, weeds will need to be removed while dead plants may need to be replaced. Once the plants in the rain garden have become established and grow larger, they will eventually out-compete the weeds. Absolutely! Building it yourself will save you money and provide you with a greater sense of accomplishment. 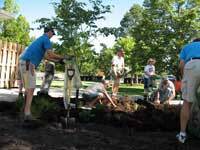 Many homeowners finish their rain garden in one afternoon. Digging the garden is the most time consuming task, as 6-8 inches of soil depth is typically removed to add amendments. Involve your entire family or invite the neighbors over and make a party out of it. To get started, we recommend you conduct a soil test and an infiltration test. You can do both of these tests yourself which will ensure the success of your rain garden. Dig a hole about 6-12 inches deep and at least 4 inches in diameter in the rain garden site (roughly the size of a coffee can). Fill the hole with water and let it sit for an hour or two to pre-wet the soils for your test. Then refill the hole with water and push a popsicle stick into the side of the hole to mark the water level. After an hour, measure and record the depth of the water again. You may want to continue taking measurements at hourly increments for a few more hours. If the water level dropped one-half inch or more; this is a perfect site for a rain garden but you might still want to consider soil amendments (like peat moss). If the water level dropped less than one-quarter of an inch; you will have to amend your soils or try another site. Collect a few teaspoons of soil from 4-6 inches beneath the surface. Place about 2 teaspoons of soil in the palm of your hand and add drops of water until the soil has reached a consistency that makes it moldable, like moist putty. Knead the soil as you add the water drops. Form the soil into a ball and place the ball between your thumb and forefinger. While gently pushing the soil with your thumb, squeeze the soil upward into a strip of uniform thickness and width. Allow the strip, or ribbon, to emerge and extend over your forefinger until it breaks from its own weight. If the soil could not remain in a ball form; you have sandy soil. If the soil formed a ribbon less than 1 inch long before it broke; you have silty soil. If the soil formed a ribbon 1-2 inches long before it broke; you have slightly clayey soil. But if the soil makes a ribbon greater than 2 inches before it breaks, then you have highly clayey soil which is not a suitable for a rain garden. Refer to the list of links below to guide you through calculating garden depth, garden size, placement, and plant selection.